Students at Lanigan Elementary School have full buckets and a reason to celebrate. 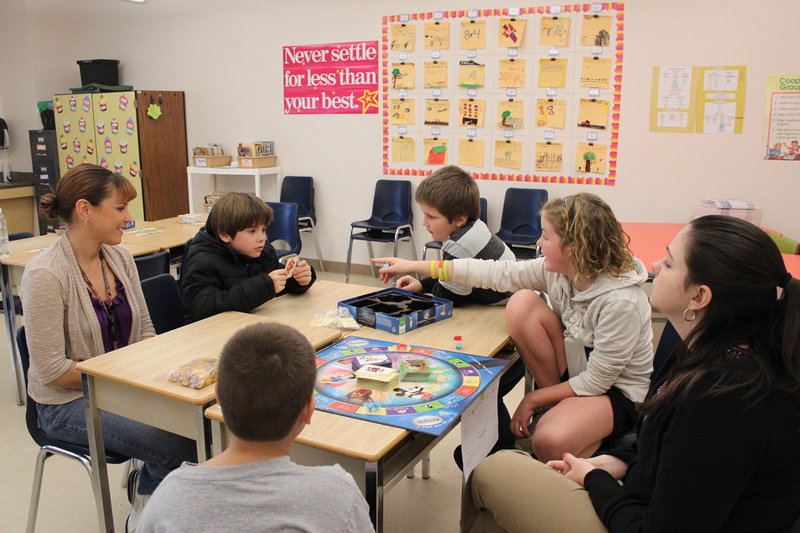 Lanigan Elementary School students play a game of Disney Trivial Pursuit during a recent PBIS celebration to recognize positive behavior. Clockwise above, starting at left, are: teacher’s aide Jen Longley, Samuel May, Joey Brown, Julia Brown, fourth grade teacher Samantha Finocchiaro, and Alex Dillingham. Students fill their metaphoric buckets each school day by demonstrating kindness, appreciation and acknowledging the school’s following four behavioral expectations: Be Respectful, Be Responsible, Be Safe, and Be a Problem Solver. With the first quarter of the school year behind them and their buckets filled to the brim, students at the school were rewarded with a PBIS celebration and an opportunity to watch a movie or participate in a fun activity of their choice. Some students at Lanigan Elementary School opted to participate in a dodgeball tournament during the school’s recent PBIS celebration to acknowledge positive behavior. Pictured above are fifth grade student Isaiah Mendoza, foreground left, sixth grade student Gage White, background, and sixth grade student Adam Arduini. 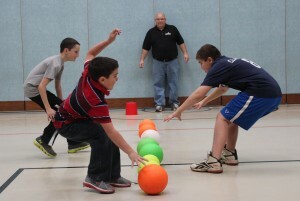 Serving as an official for the dodgeball tournament was sixth grade teacher Harry Meeker. 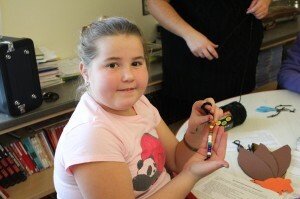 Lanigan Elementary School fifth grade student Abbi Wood made a Thanksgiving Story Bracelet during her school’s recent PBIS celebration to recognize students for positive behavior. The bracelet tells the story of the first Thanksgiving with each color representing a different and important detail.